As I've said before, I've never had a Rachael Ray recipe that I hated. Admittedly, I pick the ones that I know I will liek, so it's not too much of a shocker that they don't let me down. When I decided to make Tuscan-Style Chicken Cutlets, it was mostly because I was feeling lazy and it looked very easy. I learned this isn't the best criterion to use when picking recipes. Now, don't get me wrong - this was still way better than anything I made before learning how to cook. However, it didn't wow me. It was very simple and didn't have the usual flavor that I'm looking for. It was still good, but not great (hence the yum, but not yum-o). In its defense, this recipe was very easy to cut in half and only took about 25 minutes. You can find it in the old school Comfort Foods cookbook. Beat eggs in a shallow dish. Mix flour, poultry seasoning, and salt and pepper in a second dish. Place a cookie sheet in oven on low heat, about 275 degrees. Heat 1/2 inch oil in a large, deep skillet over medium heat. Coat chicken in flour, shaking off excess. Remove pieces one at a time. Coat each cutlet in egg, draining off excess. Add cutlets to oill, 2 or 3 at a time, and brown till lightly golden, 3 minutes on each side. Place cutlets in oven on low and repeat process until all cutlets are done. Serve with lemon wedges and Creamy Spinach. Sort spinach leaves and remove large, tough stems. Coarsly chop and set aside. Heat a deep skillet over medium to medium low heat. Add oil and butter. When butter melts, add shallot and saute for 2 to 3 minutes. Whisk in flour and cook a minute more. Add milk and whisk until smooth. Add cream cheese and whisk until melted. Add nutmeg. Place spinach into the pan in stages. 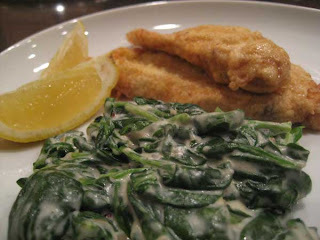 Turn spinach in sauce, and as it wilts, add more and more greens. Season with salt and pepper.